Brand new state-of-the-art creeping bentgrass for the elite golf course! Bred by Jacklin, Ignite (known as V8 in USA) is a brand new powerhouse creeping bentgrass developed for any golf course wanting that “world-class” look. V8 is a hybrid between two elite breeing lines selected for its close-cut tolerance and improved dollar spot resistance. 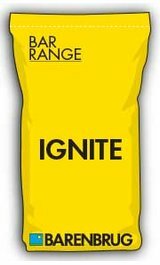 IGNITE has been seeded on golf courses worldwide and has received excellent independent evaluations in current NTEP (National Turfgrass Evaluation Program) putting green trials comparing it side-by-side with other commercial and experimental bentgrasses.